Powerdown is an incredibly challenging puzzle game developed by Dave Allanson and compatible with an iPhone, iPod Touch, and iPad supported by iOS 4.0 or later. The game costs $0.99 and there is also a lite version offered gratis for a limited time only. The inspiration for this game comes from a puzzle game called Lights Out. For those of you who do not remember Lights Out it was released in 1995 and the dynamic of the game was that the player was given a grid with on and off lights that had to be toggled an odd number of times to be all turned off. If you were a Lights Out lover waiting for someone to bring it to the Apple application world then you just got your big break because this app is the only one of its kind. If you are looking to test your mental faculties and ability to problem solve intuitively, then Powerdown is the game for you. It is truly the most difficult game I have come across. There are 50 locked levels that you can access one at a time as you start completing them starting at level 1. 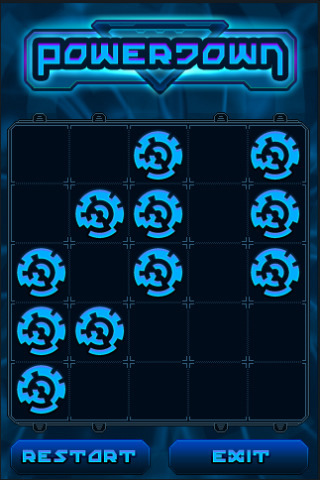 In the first puzzle you are given a grid with 3 lights turned on. The goal is to turn all the lights off but the rule is that when you hit a light, it will, along with the four adjacent lights, switch on or off depending on its current state. The light will turn off if it is on and on if it is off. This may not seem too taxing but it is hard work. You have to somehow get the lights, which are spaced out in a row with a square in between them, in position so that they are all on and touching each other. That way when you hit one of them they will all turn off at the same time. Embarrassingly enough, I have not made it past the first puzzle. I am pulling my hair out trying to strategize my way into the next puzzle but to no avail. If you are bored with what is out there and love a good mind teaser then pick up Powerdown. AppSafari review of PowerDown was written by Vanessa Paszterko on October 8th, 2010 and categorized under App Store, Games, Puzzler. Page viewed 3676 times, 1 so far today. Need help on using these apps? Please read the Help Page.